HIIT cardio is heralded as the best way to burn fat without doing hours and hours of cardio. I would have to agree with all of the kudos given to HIIT cardio, but I feel most people do not do it correctly. 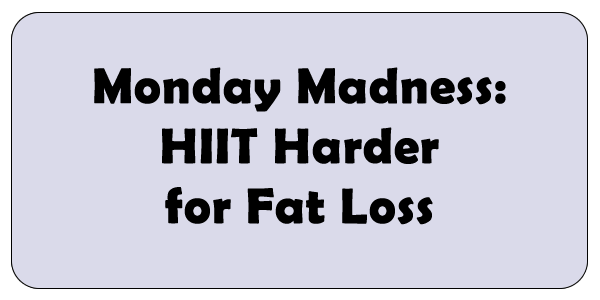 In today's Monday Madness I am going to take a look at the 5 ways you can HIIT harder and increase your fat loss. When you complete a high interval while doing HIIT cardio you have to just about kill yourself. I don't mean literally of course, but when you finish the high interval you should be breathing very hard and you shouldn't be able to talk. If you can talk then you didn't do the high correctly. The high should tax you enough that you almost feel like you can't go any further. That brings me to the rest period. After you complete the high interval you need to recover. Use the HIIT cardio rest interval for that purpose. Take as long as you need to recover. It isn't a good idea to start another high interval before you have recovered. It only encourages you to not go as hard as you can. I switch things up by doing very heavy farmer carries or running sprints in my neighborhood. Just like it is necessary to change up exercises in order to get maximum results, cardio needs to be changed up as well. Your body will get used to any one singular approach if used for too long. Keep it guessing. This one is very important. HIIT cardio is supposed to make you work at your highest possible level. You can't do that if you've exhausted your body with weight training earlier that day. At the same time, HIIT cardio will stress your body enough that you won't be able to lift as well later. Do your HIIT cardio on a day when you are not lifting. If that is not possible, do it at least 8 hours apart from your weight training session. Many people get stuck on a total amount of minutes for HIIT cardio. I say you should vary the length of your HIIT sessions. Do some short, medium and long sessions. You can extend a session by doing some steady state cardio at the back end.